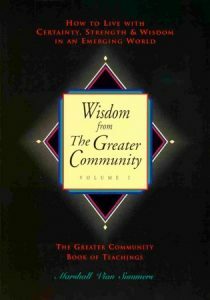 Wisdom from The Greater Community Volume One is a wise and compassionate guide for discovering the New Message teaching on the power of relationship and inner certainty in everyday life. Wisdom from The Greater Community Volume One speaks to that persistent feeling that there is something important to do in life. It provides a Greater Community perspective on topics ranging from “Marriage” and “Achieving Peace” to “Provoking Change” and “World Evolution.” Wisdom One cuts through the uncertainty and confusion of our time and enables you to find and to follow what you have always deeply known. Wisdom from the Greater Community Volume I is the first book of Volume 5 of The New Message from God.